How can I choose calendar colors for different members of my team? In Less Annoying CRM’s new calendar, you have the ability to select colors for not only your own subcalendars, but other users’ calendars as well. 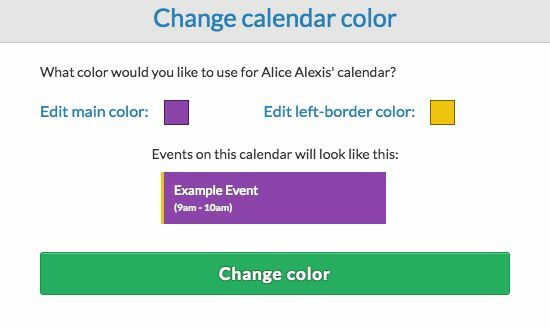 This tutorial will show you how to change other users’ calendars, as well as some ideas for color coding. When you view someone else’s calendar in LACRM, you are viewing all of their public events and tasks. You will not be able to view their private agenda items, and you will not be able to distinguish between their given subcalendars. 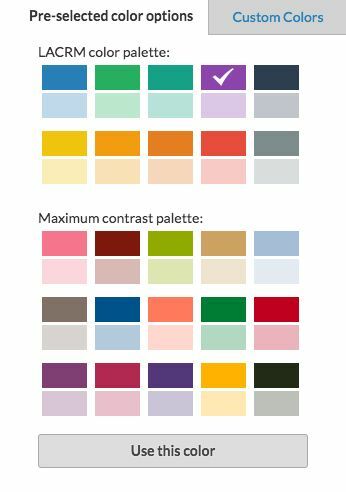 An important thing to note here is that changing a users’ calendar color from your account will not change the display color from someone else’s view. For example, if Bob is a user on my account and I make his calendar color yellow, this will only change the way I view Bob’s calendar. No one else will see his calendar as yellow. 1. Navigate to your Calendar in LACRM. On the left side of the calendar page, you should see a checkbox for “Other calendars.” Make sure the checkbox is ticked off so that you can see everyone else’s calendar. Note: if you don’t see a box for “Other Calendars,” it’s likely that you don’t have permission to view other users’ calendars. If you’re an administrator on your LACRM account, you can give yourself access to other users’ calendars from the Manage Users page. 2. 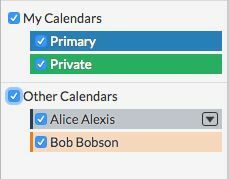 Hover your mouse over any user’s calendar under “Other Calendars”. You should see a black arrow appear. Click on the black arrow, and select the option to “Change color”. 3. Here’s the fun part! You can choose a main and border color for each users’ calendar. You can pick colors from our pre-selected color options, or you can select a custom color. Now, you can toggle between people's calendars from your Calendar page in LACRM. You can check off people's calendars on the left hand side of the page to make them visible, and uncheck them to hide them from your main view. If you want someone's calendar to stand out, hover your mouse over their name on the left hand side of the page; everyone else's calendar will fade away, and their calendar will stand out. Have different teams or departments in the same CRM account? Select the same border color for everyone on a single team. If you have multiple teams in LACRM, give everyone on your team a bright color, and give everyone on other teams a lighter, pastel color. If you want someone’s schedule to stand out, give them a neon main color. Tyler groups all the different types of people at LACRM by background color. In his calendar, partners are light blue, CRM coaches are light yellow, and developers are light green. Then, he gives each person a different, darker left-border color. This way, Tyler can see at a glance when each team is busy. If he wants to see when a particular person on a team is busy, he can mouse over their name on the left hand side of the calendar, and all of the events on that particular person's calendar will be highlighted. Still have questions? Less Annoying CRM comes with free phone and email support - even if you're not a paying customer! Use our contact page to get a hold of us, and we'll be happy to help however we can.